I have just the app to spice up your boring homemade movies. From now on, make sure all of your videos go viral with FXGuru for Android. It’s not new, but it just received a nice update this morning, bringing better support for HD displays, a new Valentine’s Day robot effect (just a day late), and easier restoration of previous purchases. 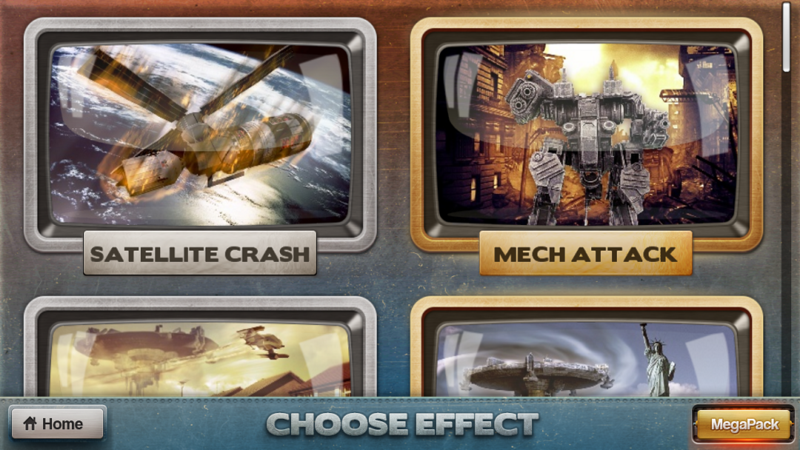 The app comes with one free effect and one un-lockable effect if you share the app on Facebook, totaling to two effects you can try for free. Each additional effect will cost you, but that’s the name of the game. Currently, I am unable to see how much each effect is because Google Play is uncooperative. Just my luck. I went ahead and had a satellite crash happen outside my front door to test it. Needless to say, I am now submitting it to my local Fox News affiliate and will see if they take the bait.